These Mussalla Namaz Mat are available in different sizes with latest designs and colors. These mats are provided in various different colors, prints and patterns and are widely acknowledged among our valuable clients. Appreciated in the market owing to its high tear strength and exceptional quality, these products are available with us in different lengths and specifications. 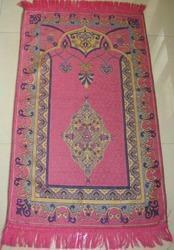 Furthermore, this Namaz Mats has gained wide appreciation in the marketplace for its remarkable quality.